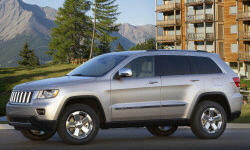 2013 Jeep Grand Cherokee Pros and Cons: Why (Not) This Car? Jeeps have traditionally prioritized off-road performance, and this has necessarily compromised their on-road behavior. But the Grand Cherokee was given a dual mission: manage the Rubicon Trail yet stand in for a luxury car about town. The third generation Grand Cherokee was deemed civilized enough for an on-road-only SRT8 performance variant. The current, fourth-generation Grand Cherokee makes the third seem crude in comparison. But does this make for a better SRT8? Any interior color you want as long as it's black with real carbon fiber trim. Why the 2013 Jeep Grand Cherokee? Compared to its predecessor, the fourth-generation Grand Cherokee is 3.2 inches longer, 3.0 inches wider, and 1.7 inches taller. Consider this substantial growth and the SUV's greater refinement, and a 424-pound weight gain shouldn't surprise. But weight is the enemy of performance. To counteract this gain, Chrysler bumped the SRT V8's size by 0.3 liters, to 6.4, and its output by 50 horsepower. Pit 470 horsepower against 5,150 pounds, and sixty mph arrives in less than five seconds despite the mediation of a somewhat slow-witted, tall-geared five-speed automatic. The big V8 still rumbles and roars, but its vocals are less raw and less loud. Good for competing with the big(ger) buck Germans, not so good for spine-tingling thrills. The 2014, due in March, 2013, should be quicker and more responsive thanks to an eight-speed automatic with launch control. The 2006 Grand Cherokee SRT8 most surprised me with its handling. Though its steering was vague, its chassis managed curves with unexpected balance, precision, and composure. Despite the addition of an independent rear suspension, the 2013's handling impresses less, partly because the average has improved, but also because of the size, weight, and refinement increases. The 2013 feels every bit its additional size and heft. The connection with its chassis feels more insulated and less direct. Even so, the Grand Cherokee SRT8's handling remains unexpectedly good for a Jeep, with moderate lean and excellent control. The all-wheel-drive system is full-time, but getting on the gas in curves nonetheless induces the rear-end to step out like in a rear-wheel-drive vehicle (especially in Sport and Track modes, where the front-rear torque split is 35:65 rather than 50:50). This oversteer is very easy to modulate. How easy? I preferred the Track mode--which also dials back the stability control--even on snow-covered roads. When steered with the throttle as well as the wheel, the Jeep rotates readily into turns. Steering, though improved, remains the weak link. Perhaps due to the Grand Cherokee's (if not the SRT8's) continuing dual mission, the Jeep's steering still isn't as firm, quick, or communicative as that in a BMW X5 or Porsche Cayenne. Prominent center exhaust is gone. Instrument panel upholstered in leather, but some buttons feel cheap. You can buy a BMW X5 or Porsche Cayenne with tame front seats, but not the Grand Cherokee SRT8. In the Jeep, SRT's signature buckets are standard. Large, firm bolsters provide excellent lateral support even to those of us with slender builds. Yet they're also comfortable, with enough padding to avoid park bench references. The four-way adjustable lumbar didn't do much for my back, but your experience may vary. Moving to the back seat, the Grand Cherokee's growth adds a couple of badly needed inches to legroom. With this improvement the Grand Cherokee only matches other similarly sized SUVs, so it's not a reason to buy. But rear seat legroom is no longer a reason not to buy, so it bears mentioning. The current Grand Cherokee appears both brawnier and more upscale than its squarer predecessors. This said, the new curves aren't as good a fit with the SRT. Despite a unique hood with a pair of nostril-like vents, the current SRT8 looks less edgy, figuratively and literally. To my eye, the $2,495 Vapor Package's black grille and wheels mostly serve to make the Jeep appear even pudgier and more massive. Lose the black bits, and it's about as handsome as SUVs get, but as in other areas some sportiness has been lost in the pursuit of luxury and status. Like the other "why to buys," this one equivocates. Compared to a similarly powerful, $90,000+ BMW, Mercedes, or Porsche SUV, the Jeep is cheap. But the Grand Cherokee SRT8's $61,290 base price is about $15,000 higher than the 2010's was. In the 2013's defense, it includes over $4,000 in additional features, including the driving mode adjuster, adaptive shocks, and a leather-upholstered instrument panel. Even factoring in the current SUV's additional size and refinement, the price jump seems perhaps $5,000 too high. Why Not the 2013 Jeep Grand Cherokee? Even with adaptive Bilstein dampers that automatically soften in casual driving the Grand Cherokee SRT8 has a busy, lumpy (but not harsh) ride. Twenty-inch wheels shod with 295/45ZR20 tires contribute more unsprung mass than the suspension can manage, and the Jeep feels lead-footed as a result. Suspension tuning that seems, if anything, a little soft when you're pushing the Jeep hard often annoys when you're not. This isn't unusual with performance SUVs. When a tall, heavy vehicle must be made to handle, something's got to give, and that something is ride quality. The Vapor Package includes an entirely black grille, black wheels, and some other black trim. The 2011 redesign included some much-needed additional legroom. In traffic the Jeep Grand Cherokee provides the outward visibility that won people over to SUVs in the first place. The pillars flanking the windshield are a little thick, but you sit higher than in most other vehicles. Visibility to the rear is limited by how high the windows are off the road, but this is also typical of SUVs. Not quite as typical: nose into a parking space and it's nerve-wrackingly difficult to tell where the front corners are. Forward obstacle detection or around-view cameras would help, but neither is available. Jeep recognized that something had to be done to make the Grand Cherokee's interior suitable for a vehicle with a sticker price over $60,000. So a leather-upholstered instrument panel, rarely included at this price point, is standard. It helps, but the black interior still lacks the warmer, more upscale ambiance of the earth-toned Grand Cherokee Overland Summit. The buttons are the same as those on the regular Grand Cherokee and on many lesser Chrysler products. Many feel insubstantial, most notably those on the steering wheel. The 2014 update includes a revised interior with reconfigurable LCD instruments and new controls. These look better. Hopefully they also feel better. If you want the interior in a color other than black with carbon fiber trim, you're out of luck. Jeep deserves credit for making the Grand Cherokee SRT8 perform as well as it does, with strong acceleration and highly competent handling. But the current, more luxurious SRT8 feels larger and less visceral than the original, and it isn't as fun. This makes the much higher price, awful fuel economy, and annoying ride harder to accept. The upcoming changes for the 2014 improve fuel economy a little, but likely won't affect the ride. And the price? It's going up another $2,700. The 470-horsepower 6.4-liter V8 isn't hidden under a cover. One-week loan. Jeep provided an insured vehicle with a tank of gas. 2013 Jeep Grand Cherokee pros and cons, according to Michael Karesh: the best reasons for buying (or not buying) the 2013 Jeep Grand Cherokee. Join TrueDelta to post your own impressions.